Who doesn't love an extra long, leisurely breakfast with family, friends, or both? Many of our guests consider breakfast to be one of the best parts of their hotel stay. 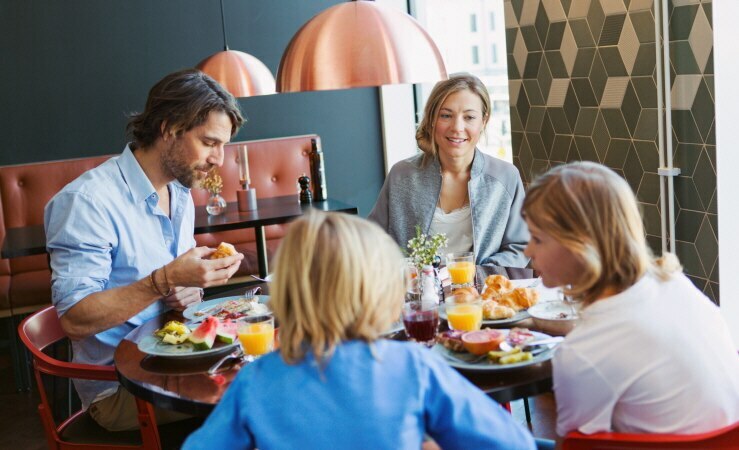 That's hardly surprising when our luxurious breakfast buffet offers everything from freshly baked bread and Brie to pancakes and scrambled eggs. Thomas Fankl is responsible for food and beverage at Scandic. He shares his own views on the latest breakfast trends. Seeds, grains, smoothies and loads of fruit are the hottest breakfast trends right now, according to Thomas Fankl. The current strong health trend is clearly visible in the sort of breakfast people want. Porridge has also become popular and at Scandic's breakfast buffet, we have a porridge station with toppings such as fresh berries and granola. A million miles away from the old-style porridge with jam. "It's very clear these days that guests are looking for other options. And the term 'healthy' is very subjective, so the great thing about a breakfast buffet is that our guests get to decide and choose items that they personally consider to be healthy", says Thomas. Another trend is that the requests for gluten- and lactose-free food increases every year. It's important that everyone enjoys the same delicious breakfast, whether they have allergies or prefer a vegan dish. "It's incredibly important to us that all our guests enjoy a delicious breakfast. We listen to our guests and truly appreciate their feedback. This has meant that we now have several varieties of gluten-free bread, lactose-free products, rice drinks and vegan toppings, amongst other things. In addition, we're expanding our organic products all the time", says Thomas. A really good breakfast according to Thomas – whose job is all about making sure this is what our guests receive – is achieved through appealing to all 5 senses. "Breakfast isn't just about the food, it's about the background music, the right cutlery and the tempting aromas wafting around the breakfast room. If we appeal to all the senses, breakfast is sure to be a captivating experience", says Thomas. Something to also bear in mind when you serve a breakfast buffet at home. Breakfast buffet to suit everyone, from different types of food allergies and for vegans.